Punjab Chief Minister Parkash Singh Badal today said that certain shortcomings in New Crop Insurance Scheme launched by the Government of India (GoI) needs to be overcome so as to make it a more ‘farmer friendly policy’.Interacting with the media persons here on the sidelines of Sangat Darshan program of Nawanshehar assembly segment here today, the Chief Minister said that declaring village as a unit for crop insurance would hardly fulfill the basic spirit behind introducing this scheme. He reiterated that scheme must ensure that plot was considered as a unit to compensate the farmers for their loss. Likewise, Mr. Badal said that ensuring the crop only if whole village pays its premium was also an impractical assumption. “We are bringing all these things in the notice of GoI and will urge them to amend the scheme so that more and more farmers especially the original green revolution states like Punjab, Haryana and Western Uttar Pradesh are benefitted from it” he added. Replying to another query, the Chief Minister said that the state government was fully committed to nab the culprits of killing a person in Abohar. Refuting the allegations leveled by Congress party that main accused of this case was associated with Shiromani Akali Dal, Mr. Badal said that these were baseless allegations as the concerned person was not related to Akali Dal whether directly or indirectly.Asked to comment on probe being carried out by National Investigation Agency (NIA) in Pathankot terror attack, the Chief Minister said that the national agency was probing the incident very minutely and any one found guilty in this case would not be spared at any cost. He said that the state government was adopting a zero tolerance towards the issues involving national security, law & order, peace and brotherhood. “Anyone found indulging in such issues of grave national importance will not be spared at any cost” added Mr. Badal. Replying to another query, the Chief Minister said that Punjab was the only state in the country where the entire government goes to the doorsteps of the people to solve their problems through Sangat Darshans. He said that this pro-people exercise was proving to be a boon for the general public as majority of their works were done on the spot. 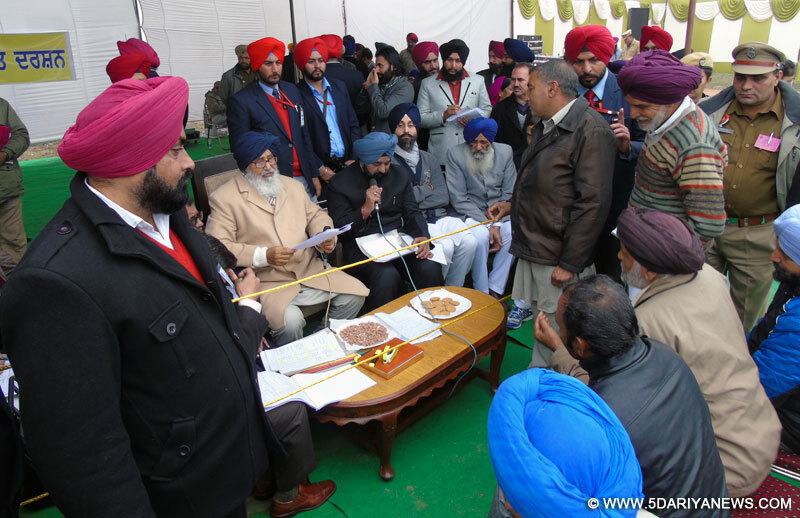 Mr. Badal refuted the allegations regarding discrimination in allocation of funds adding that opposition was criticizing this program just for the sake of criticism.Earlier addressing the public gatherings in village Urapar and Wazidpur, the Chief Minister announced that he would continue to hold Sangat Darshans across the state. He said that Sangat Darshans were being organized every month in atleast three assembly segments of the state. “This is a growth oriented program and nothing can deter me from carrying on this exercise” added Mr. Badal. Listing the major initiatives taken by the state government, the Chief Minister said that the alliance government has decided to double the pensions given to people under the social security schemes besides hiking the honorarium of the Nambardars. Likewise, Mr. Badal said that in a pro-poor initiative to provide far better health care services to economically weaker sections of the society, the state government has decided to enhance the existing limit of free treatment in government and private hospitals to nearly 28.50 lakh blue card holders from Rs 30,000 to Rs 50,000 annually under ‘Bhagat Puran Singh Sehat Beema Yojna’.Interacting with a delegation of cane growers from the region at village Urapar, the Chief Minister assured them that the state government was firmly committed to bail out the farming community from any sort of problem. He said thatRs 540 Crore arrears has been already paid to sugarcane growers by Government besides arranging Rs 200 Crore loan to Private Sugar Mills for sugarcane arrears. Likewise, Mr. Badal said that Punjab Government has also decided to give Rs 295 per quintal for sugar cane against Rs 220 fixed by the Centre.He said that the state government was providing free power to farmers of the state at a cost of Rs 5000 crore every year.The Chief Minister was accompanied by Chairman Markfed Mr. Jarnail Singh Wahid, Chairman District Planning Committee Dr. Sukhwinder Sukhi, Special Principal Secretary to Chief Minister Dr S Karunaraju, Deputy Inspector General of Police Dr SK Kalia, Deputy Commissioner Mr. APS Virk and Senior Superintendent of Police Mr. Snehdeep Sharma.